50 years ago, my visionary Maths teacher, started an after-school class in computer programming. I was just 14 at the time and one of only four students that signed up for this course. It changed my life – and for this I owe my Maths teacher a huge debt of gratitude. He was a former Spitfire pilot with unstoppable energy and an infectious passion for innovation. He managed to persuade the local Polytechnic to allow us to install a teletype machine which was connected to their PDP 10 computer from our classroom. By today’s standards, the line speed was slower than tectonic plates – but, to us, it was cutting edge. 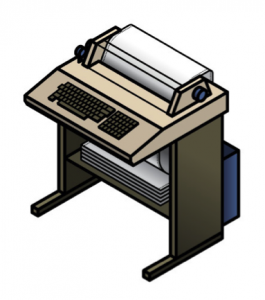 (If you have never seen a teletype, take a look at the picture above – it’s a graphic illustration of how rapidly technology has evolved in 50 years). In one sense, the teletype was just a glorified typewriter. It had a keyboard and a printer but it also had a paper tape reader and writer. You typed in your program and, when you were happy with the results, you created your paper tape. You then ran the tape through the reader and uploaded it to the PDP 10. Since the memory on the PDP was so small and the line speed so slow, it taught you to be very efficient from a programming standpoint – a discipline that served me well for my entire career. My home life was rich in affection but often very stretched on finances. Pocket money wasn’t a given, I had to go out and earn it. But this reality was no disadvantage. It taught me to look for opportunities and to think commercially. By the time I was 14, this entrepreneurial spirit was already quite well developed. So, while my fellow students devoted their energies to developing early computer games, I went in search of something profitable. I asked my Maths teacher to help organise an introduction to the local council. This led to a meeting with some senior officials where (in my first-ever business pitch) I explained how a program could simplify and make sense of this whole process – analysing attendance stats and even flagging up worrying patterns for all local schools. Despite my nerves, the message must have struck a chord because, two weeks later, I was awarded my first paid programming gig… the year was 1969! One of the first to do a commercially-oriented Computer Science degree? Having caught the programming bug, I naturally decided to do an ‘A’ level in Computer Science (I was among the first block of students to take this newly-created exam in 1973). I then started to cast around to find a Computer Science degree course. At that time, most universities were well behind the curve. The majority offered courses with either a strong mathematical or a hardware engineering bias. What I wanted was a software engineering course with a sharp focus on business applications. Unfortunately, no such course seemed to exist. I was on the point of giving up hope when I read that, in 1973, Imperial College would be pioneering a brand-new course. One that broke with traditional thinking (where computing was just an embedded component within a much broader course). Serendipity! Being a pioneer has always appealed to me… so off to Imperial I went. Imperial was way ahead of its time. It still is. Ranked as the second-best place in the world to study Computer Science (after MIT), it remains a true centre of innovation and learning. Over the course of three years, I learnt to program in nine different languages. I learnt about Object Oriented Programming (10 – 20 years before it became mainstream). I also learnt to write simulators. And given my strong business orientation, I was given the freedom to write two simulators that had real life applications. The first, looked at ways to minimise waiting time by reprogramming banks of lifts in high-rise buildings. The second simulator looked at the most effective way to organise queues – for example, in a bank, was it faster and more efficient to have a single queue serving multiple tellers or a series of dedicated queues each serving an individual teller? A few banks heard about my work and adopted the ‘single queue for multiple tellers’ solution – so it is possible that I might have already saved you a lot of waiting time! 😉. In the early 70s, management consultancy had emerged as a new discipline from the shadows of mainstream accountancy. It was the love child of a staid profession. And being hidebound, most practices insisted on a full accountancy training before branching out into the ‘Johnny-come-lately’ world of consulting. The prospect of number crunching and mind-numbing audits was not my idea of fun. And I was on the point of giving up when fate played another hand. I stumbled on a firm called Arthur Andersen & Co. They had just established a new management consultancy practice and, unlike their peers, they were prepared to waive the accountancy rules. I instantly applied, tore up my other job applications and hoped to heaven that they would recruit me. In the land of the blind, the one-eyed man is king! I started as a junior management consultant in 1976. I was employee number 76. Today this firm – now known as Accenture – has 12,000 employees in the UK alone and 459,000 worldwide! On joining the firm, I found that I was one of the first Computer Science graduates they had ever recruited. At the time, I was unaware of this significance. In hindsight, though, it shows just how visionary they were in appreciating the future business impact of technology. Remember, this was only thirty years after IBM had predicted: “there is a world market for about five computers”. In many respects, I was a test pilot. In order to trial the potential of computing, the firm had to hire some people who knew something about programming. To put it bluntly, instead of training me to become a Management Consultant they wanted me to help them develop more Software Engineers, at least at first. “First”,he said, “remember the saying about the one-eyed man in the land of the blind. You are one of the very few software engineers in our practice, so your progress through this firm could be pretty rapid.”And he was absolutely right. “Second, we definitely will train you in management consultancy. We need consultants who are ambidextrous – software engineers who really understand how to use technology for business advantage.” And, once again, he was bang on the money. The firm was also very prescient. It appreciated the fundamental truth that most business people are confused by technology and most technologists are equally perplexed by business. Someone needed to bridge that divide. And by developing our business and technology skills in parallel, the practice was creating that fertile ground of understanding. Technology is just a tool. It only becomes valuable when it delivers real, tangible business benefits. Contrary to what I had been taught at university, a tested and proven piece of code is not the ultimate outcome. Code must be deployed to deliver a genuine, measurable business outcome to be of real value. The income from some projects was extremely modest – but they were immensely valuable. They proved that we could innovate business operations rather than simply automate them. And that is a big distinction. Indeed, my very first project was to create a program that would allow a salesperson of caterpillar-type trucks to configure and price a new vehicle – in real-time – for customers. No-one in the world was doing this and, quite frankly, our client thought it was mission impossible. However, in just a few weeks of pretty intensive programming, we proved him wrong… and won the client’s enduring respect. Transferring Medical Records. When someone moved home, it used to take 14 weeks for medical records to pass from their old GP practice to the new one. For patients with acute medical issues this was utterly unacceptable. My ambition was to reduce this timeline by 50% – but, in the end, managed to cut the transfer time to just 2 – 3 weeks. Interestingly, we did it without any programming – we simply applied some out-of-the-box thinking. Creating a 3D virtual bank branch.My visionwas to create a touch-screen based system (with no keyboard) that emulated a real branch. Customers could then serve themselves without any human interface or involvement. This system may not sound so ground-breaking today but, 25 years ago, it was revolutionary. It collected numerous global awards – but, even more importantly, it won unanimous praise from customers. Building the first AI-driven, self-sales system. This was abold mission to turn AI – a technology in its very infancy – to real commercial advantage. Even today, this is not something we see very often but – developed and delivered over 20 years ago – this system was more Star Trek than hi-tech. I spent 23 very happy years at Accenture helping major brands across the world to innovate. I also helped to inspire and train an ‘army’ of fellow innovators – many of whom have gone on to make their own personal impact on our planet… and its people. Eight years ago, I created and launched a new company called Clustre. I set out with one, single-minded mission: to help large corporates to become more innovative… and, by adopting best-of-breed new thinking, to become significantly more successful. In the last decade, the centre of gravity in our world of business innovation has shifted. Today, the really clever technology-led solutions are being developed and delivered by agile niche firms. Unfortunately, because these small teams are often invisible and hard to evaluate, they go unnoticed. So, we have made it our business to search out the leading innovators in 7 key technology sectors that are now transforming our world. We thoroughly check credentials and independently validate every service claim. Only then do we connect these outstanding niche firms to major companies in need of really inspired solutions. In a sense, Clustre is the ultimate professional dating agency. The niche firms we have introduced have conceived and frequently delivered transformational – sometimes even game-changing – products and services for many of the world’s largest corporations. That is a measure of the value we deliver. And that is why this final chapter in my career is proving to be so personally rewarding. Seek out wicked problems. Removing pain is a primary human instinct – more important even than the pursuit of pleasure. So, start by looking for obstacles to growth or issues that seriously impact your business performance. Innovation feeds off these problems. Alternatively, look for ways in which you can grow your business and then search for innovative ways to drive that growth. These basic disciplines will positively impact the financial performance of your business and demonstrate the true power of innovation. Question everything. Start by questioning whether you fully understand the real nature of the problem. As Albert Einstein once said: “If I had an hour to solve a problem, I’d spend 55 minutes thinking about the problem and just 5 minutes thinking about solutions.” Also, always question the reflex argument “we’ve always done it this way” – precedent is very often the enemy of progress. Take a helicopter view. I and my team once solved a real conundrum in the NHS by ‘rising above’ the problem domain and the blinkered thinking of past processes. This gave us a totally new perspective and we quickly focused on a very simple, but very powerful, solution. Involve a diverse group of thinkers. Diversity distils and enriches idea creation. It also helps you to escape the straight-jacket of time-honoured practices… We recently hosted an event on ‘Rapid Problem Solving’ that took this concept to another level. We invited 30 ‘C’ level executives, from a wide variety of industries, to focus their broad-based experience on a very specific industry problem. As an example of collective problem-solving it was hugely impressive. But as an object lesson in the value of diversity, it was awesome. Look for solutions that makes everyone’s lives easier. Look to make thebiggest impact on the most people. The most elegant solutions are invariably the ones that enrich the lives of the many, rather than the minority interests of a few. Move fast. Light lots of fires! Innovation has been around since the dawn of time so what’s the big deal? Here’s my answer…When I first started innovating, you had the luxury of months – even years – to tackle challenges. The pace of change was gradual – sometimes even glacial. But now, the pace is frenetic. New competitors can pop up and eat your lunch before you’ve even seen the threat. You have to be vigilant and very alert… work as fast as – or even faster than – your rivals… and spread your innovation energies as widely as possible. Since you never know where the next threat is coming from, you simply have to think big and light lots of fires. Short-sighted complacency is the death of innovation. While that council estate teenager was making his first foray into Basic programming, something far more momentous was happening 238,855 miles away. Neil Armstrong was stepping onto another planet and leaving his emphatic mark on the innovation universe. To navigate and land Apollo 11 on the Moon, using considerably less processing power than today’s average smartphone, makes NASA’s achievement all the more remarkable. It puts the pace of change over the last 50 years into jaw-dropping context. It also explains why I remain fascinated and mesmerised by human ingenuity. I just can’t wait for the next 50 years (assuming medical science can help me to get there 😉).